As many of you know, 18-year-old Josh, from Hickory, NC has a passion for playing baseball and riding his dirt bike. Life changed for my extremely active son when he was severely injured in a freak mountain bike accident in February 2014. The accident left Josh with a C3, C4, and T8 spinal cord injury that left him paralyzed from the waist down with full function in his arms. 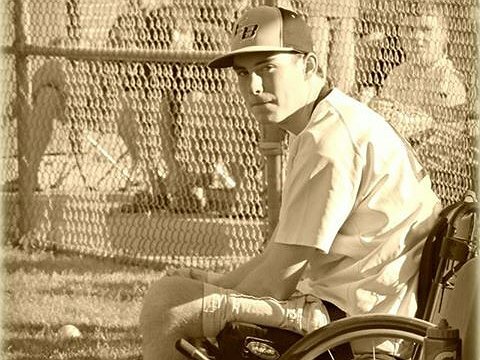 Josh spent two weeks in the hospital and seven weeks at Shepherd Rehab Center in Atlanta. Josh is an inspiring young man with a positive attitude who always wears a smile. He has already faced situations that most of us will never experience. Josh was able to graduate with his high school class and has plans to continue his education at a local community college next spring. Even with insurance, Josh will have many uninsured injury-related expenses such as: continued outpatient therapy at Race to Walk, co-pays and deductibles, home modifications and durable equipment. Of particular note is the outpatient therapy that Josh is currently receiving. Race to Walk is a state-of-the-art therapy program which offers advanced therapy unlike most rehab centers. We have already seen the improvement that Josh has experienced since he has been there and we do not want to slow his progress by moving him to another rehab center. To help offset such expenses, a fundraising campaign in Josh’s honor has been established with HelpHOPELive, a trusted nonprofit organization that has been providing community-based fundraising guidance to patients and their families for more than 30 years. All donations are tax-deductible, are held by HelpHOPELive, are held by HelpHOPELive in the South-Atlantic Spinal Cord Injury Fund, and are administered by HelpHOPELive for injury-related expenses only. If you would like to make a contribution today please click the DONATE NOW button. Thank you in advance for your donations and support of Josh during this difficult time. Together we can make a difference for Josh. We love you Josh! Praying for you everyday!! Keep your head up! You are already doing so much!